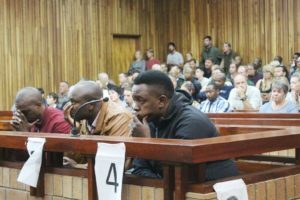 Close to 100 people in the gallery in the High Court in Makhanda (Grahamstown) today clapped enthusiastically when the Ndlovu rhino-poaching gang were handed down sentences amounting to more than 400 years each today Wednesday 3 April 2019. 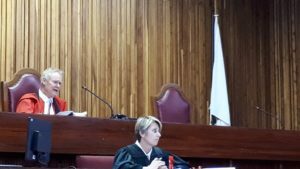 Judge Jeremy Pickering ordered that the sentences run concurrently resulting in effective sentences of 25 years each for Jabulani Ndlovu, Forget Ndlovu and Sibusiso Ndlovu. A bid to appeal the conviction and sentence was dismissed. 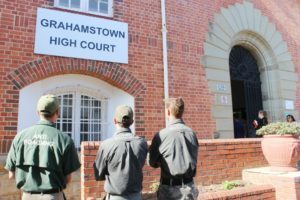 The men were convicted on Friday 15 March for 10 rhino poaching incidents around Makhanda as well as in Jansenville, Graaff Reinet and Cradock The incidents were among 13 originally on the charge sheet. Charges relating to incidents at Pumba and Sibuya game reserves were separated. During the Ndlovus’ three-year poaching spree, between 2013 and 2016, at least 10 rhinos died and 17 rhino horns were removed. Jabulani and Sibusiso were convicted and sentenced for all 10 incidents, Forget, for nine. The Prosecution was led by Senior State Advocate Buks Coetzee. After changing their defence team several times, extending the trial’s duration for close to three years, the Ndlovus finally hired ace defence advocate, Senior Counsel Terry Price. Last month the men ran out of funds to pay their lawyer and Price undertook the final leg of the trial pro bono. Led by CEO Vuyani Dayimani, a large delegation of rangers from the Eastern Cape Parks and Tourism Agency filled the back row of the courtroom for today’s sentencing. Staff from Amakhala, Pumba, Lalibela, Kariega, Camdeboo, and other private reserves were also there in their numbers. Captain Morne Viljoen of the SAPS Endangered Species Protection Unit. His detailed evidence was key to the conviction of the Ndlovu rhino-poaching gang. Green Scorpions boss for the Eastern Cape, Div de Villiers, as well as a number of local and provincial environmental crime prevention officers attended the sentencing. 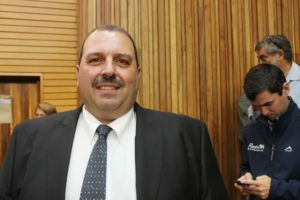 Among them was Endangered Species Unit detective Captain Morne Viljoen, whose detailed investigative work was put under the spotlight in the witness stand. 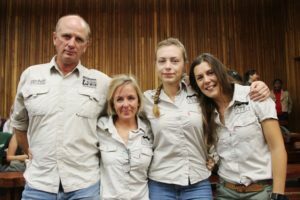 Wildlife vet Will Fowlds with Ikhala veterinary clinic staff Candice Momberg, Annie Mears and Lisa Graham after sentencing. Campbell’s horn, found in the men’s possession at Makana Resort on the night of 17 June 2016, along with the poachers’ tools of trade, proved key in linking the men to the Bucklands incident. 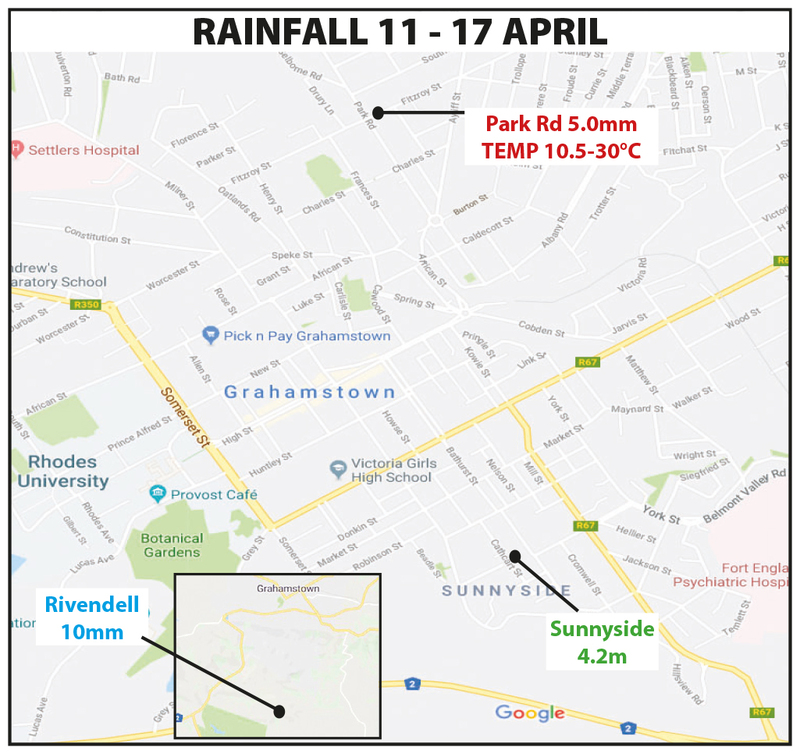 The detailed investigative work involved in assembling the evidence to convict the men included matching a yellow paint chip the size of a fingernail found at the Bucklands poaching scene with the gap on the yellow saw the men had with them. In a first, ballistic testing was done on a dart gun, matching a dart found at a poaching scene to the dart gun found in the men’s possession. The modus operandi (the dart gun and tranquilliser) along with cellphone, car hire and other travel records provided an important link with other poaching incidents. Judge Pickering, in his sentence, noted the horrifically cruel way in which the poached animals had died. He quoted from Fowlds’s description of Campbell in his report. “According to his report the rhino bull was lying in a large pool of blood and blood-tainted foam. Pickering also noted that two of the dead rhino cows had been heavily pregnant. “It is a tragedy that each of these magnificent animals had to die in such a brutal fashion in order to satisfy the demand for their horns by those who hold the utterly irrational belief that they are of medicinal value,” Judge Pickering said. Wildlife vet Will Fowlds couldn’t contain his tears. He attended many of the poaching scenes, in which the rhino sustained horrific fatal injuries. Fowlds, who previously described to Grocott’s Mail the experience of giving evidence on the 10 poaching incidents as “numbingly tragic” couldn’t restrain his tears when the sentence was passed. 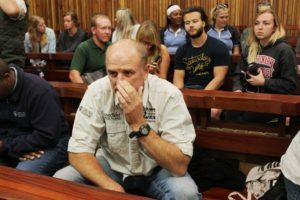 Later, when he had recovered enough to speak, Fowlds said, “This has taken three years of trial to get to, but we know from the 13 cases [in the original charge sheet]that they were poaching for four years before that. And, anecdotally, another five years before that. “Nine years in the process and the sentence issues today sends out a very powerful message to the public that we do take rhino poaching very seriously in this country. Sometimes the wheels of justice turn very slowly, but we are extremely pleased with this sentence. “Our thoughts go out to all the rhino that are not part of this conviction today. We know there are many,” he told Grocott’s Mail in an interview soon after sentencing. The gang’s modus operandi featured the use of a dart gun and tranqullisers. Judge Jeremy Pickering spoke about the horrific trauma to the animals and the three men’s lack of remorse. Judge Pickering, in explaining the severity of the sentence, said over the three years in which the 10 incidents had occurred, the men had had plenty of time to reflect on their actions and stop. Pickering viewed it as particularly aggravating that Forget was a qualified field guide. He had participated in committing the offences, while professing to love wildlife, the Judge said. Senior Counsel Terry Price consults with his clients, Forget, Jabulani and Sibusiso Ndlovu, before he appeals their conviction and sentence. It was this that Price seized on in appealing the sentence, calling it cruel and unusual and accusing Judge Pickering of employing the “sledgehammer” approach. Price held that it had been incorrect for the men to be charged with theft. He said the only charges should have been in terms of Section 57(1) of NEMBA – the National Environmental Management: Biodiversity Act and effectively argued that the other four counts in each incident were the tools of trade for the poachers. Each incident carried five counts – which was how the men ended up being convicted on 50 counts each (Forget on 45). These were theft or malicious injury to property; NEMBA (committing a restricted activity involving a protected species without a permit); Section 29 of the Cape Ordinance on Nature and Environmental Conservation (illegal hunting of wild animal by means of a device injecting intoxicating or narcotic agent); contravening the Medicines and related Substances Act; and contravening Section 90 of the Firearms Control Act (unlawful possession of ammunition). “They should only have been charged with NEMBA,” Price said. The dart guns and tranquilliser had been the means for the poachers to carry out their crime, and so should not have comprised separate charges, Price held. He argued removal of the horns fell under NEMBA and should not have been constituted as a separate theft charge. Pickering dismissed the application for leave to appeal the conviction and sentence. 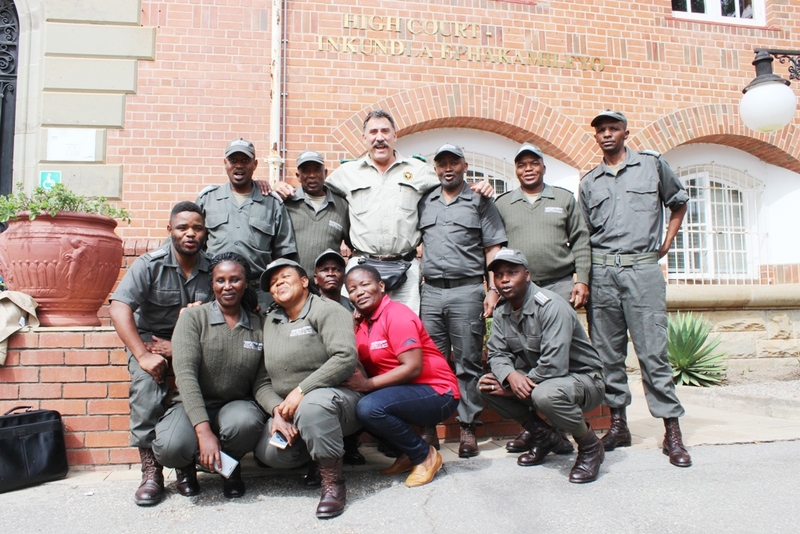 Members of the Lalibela reserve anti-poaching unit pose for a photo outside the High Court in Makhanda (Grahamstown) ahead of the sentencing of the Ndlovu rhino-poaching gang. 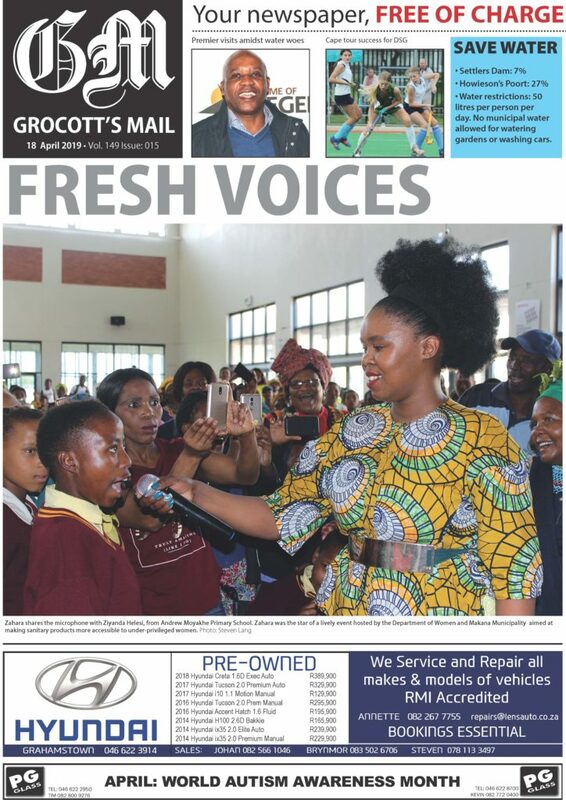 Dayimani said it was a great day for the environmental conservation sector, especially after all the political support they had received from Tourism and Economic Development MEC Oscar Mabuyane. How many years in jail? Accused number 2, Forget Ndlovu, was sentenced to 450 years imprisonment for 45 counts in nine incidents. 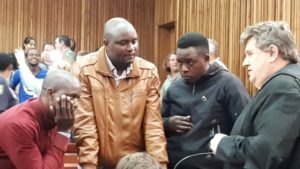 Jabulani Ndlovu and Sibusiso Ndlovu were sentenced to an additional 42 years each for an additional five counts in another incident. Their 50 counts bring their total sentence to 492 years. Judge Pickering ordered that all the 15-year sentences for counts of theft would run concurrently. All the other sentences would run concurrently with the 10-years imprisonment for count 2 (the National Environmental Management, Biodiversity Act). This means all three men have been ordered to serve a 25-year prison term.